After turning 18 years old a few years ago and after several elections in the Philippines, it was my first time to exercise my right of suffrage. Ever since I turned to the proper age to vote, I have wanted to register. But circumstances in the past years didn’t let me. Fast forward 2015 and 2016. I searched for a Comelec office in Makati City before. I wanted to register there as they say it have perks, not really knowing what are those. The Colemec website said that they have a branch office in the Central Fire Station. It was dubious to me at first. I thought the information was wrong. Why would it be in the fire station? So I called their landline phone to confirm it. The next day, I went at their office only to find out that they were on the field for satellite registration. So bad my registration couldn’t be processed. I never went back again. I became lazy. Plus they wanted me to provide proofs such as ID or house contract with an address in Makati City, to really prove that I live there. I could give them that but I was tired to go back. Then one day in October it happened. I was on my way home. I decided to pass through at The District Mall Imus to buy pasalubong. I just roamed around while looking and thinking what was best to buy. Then, at the second floor, while roaming around, I saw that Comelec had a satellite voter’s registration. What a luck! I quickly asked for the requirements. It was just a photocopy of my valid ID with an address in Imus. I presented my UMID. After that, I just filled out the necessary registration form then passed it. An officer let me look at the screen of the computer while he encoded my information on their database: to correct and verify data. They also collected my fingerprints, took a picture of me and get my electronic signature. After the process was done, they gave me a registration receipt. Both my front thumbs were full of ink. Then, I bought donuts to take home. It was May 9. After several months of officials campaigning for the positions they want to run for, their judgement day had finally come. The day where the voters chose the candidates they think were right. Monday morning. My aunt and I went to Pasong Buaya III Elementary School. We rode a tricycle to defend ourselves from the scorching heat of the sun on the way there. A lot of people was already in line to their respective precincts. Later on, we were also in line. A quarter of an hour had already passed when I had my chance to cast my vote. I intently looked for the names of the candidates I wanted to win. I marked the circles inline with their name, using the marker provided by the election officers. With less than five minutes I was finished. I didn’t vote anyone from the local position because I don’t know them. I don’t want to vote for someone I don’t know. Later on, my voter form was fed inside the Voting Counting Machine (VCM) which in turn printed a receipt of my votes. I checked if it was correct. Good thing it was. 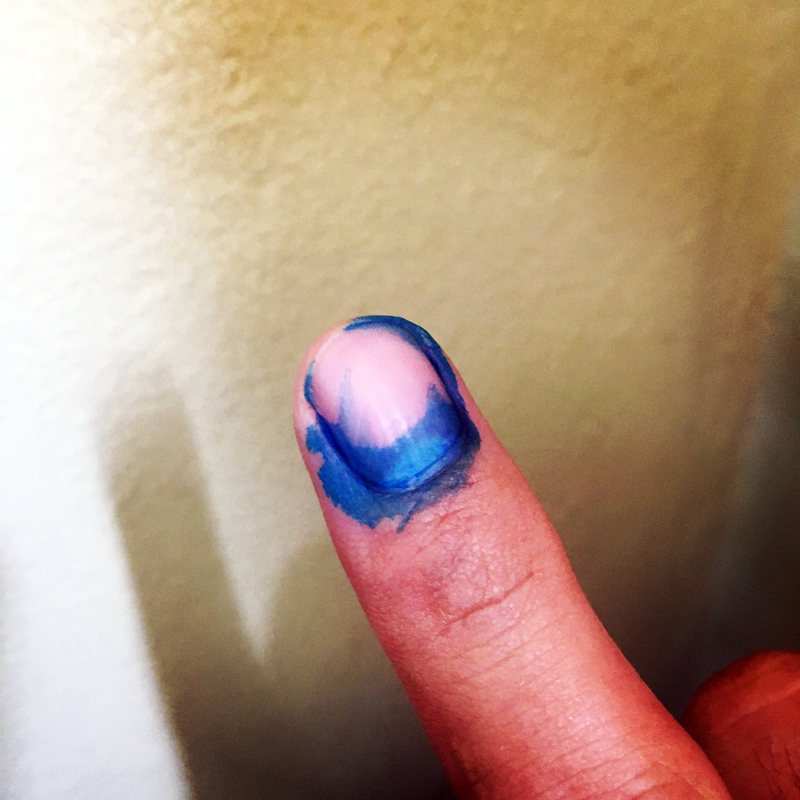 Moments later, I took photo of my inked index finger. A proof that I voted. I exercised my right. I helped to choose this country’s next leaders. Good luck to whomever will win. I just hope that they will be a competent, compassionate and clean leaders of the Philippines. This entry was posted in People & Events and tagged elections, inked, ph, vote. Bookmark the permalink.